Fall in love with Deanna. She is a cute black and white kitten with wonderful markings. There are five of Molly’s little kittens waiting to be adopted. The adorable kittens were born at the shelter shortly after their mother, Molly, arrived at Paws. Little Deanna likes people and will climb all over you and into your heart. She is a sweet kitten who likes to play. Consider adopting two kittens for double the fun! They will be the purr-fect pets. The kittens are ready for adoption, so get your application in fast. The kittens will have their shots and spay or neuter certificates when adopted. They are litter box trained. Come visit Paws Animal Shelter and adopt Deanna and one of her siblings. Stop by Paws Animal Shelter located at 1535 West US Highway 36, Urbana, Ohio 43078 or call Paws Animal Shelter at 937-653-6233. The Shelter hours are Tuesday-Friday 12-5 p.m., Saturday 12-4 p.m., Sunday and Monday-closed. You can email us at pawsurbana@hotmail.com. There are many wonderful cats, adorable kittens and fun-loving dogs at the shelter waiting for good homes. Paws Animal Shelter has a lot of kittens, cats, dogs and puppies to feed and is in need donations of Purina Kitten Chow, Purina Complete Cat Chow, Purina Dog Chow and Purina Puppy Chow. We also could use donations of bleach, laundry detergent and clumping cat litter. Paws Animal Shelter is a no kill shelter. We are a nonprofit organization that operates only by donations. We do not receive any city, county or state funding. We depend on public donations and our adoption fees to run the shelter. Please consider making a donation to help fund our shelter. We are always looking for volunteers to come to the shelter and help out. You could play with the cats or dogs to help socialize them. There are many small jobs that a volunteer could do. We also need volunteers to foster cats, kittens, dogs or puppies. 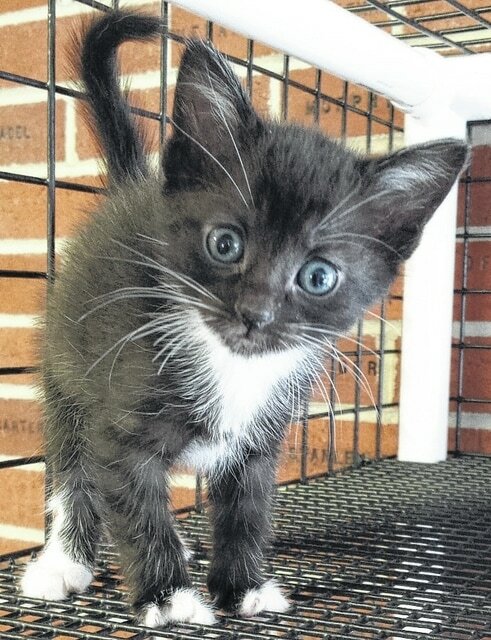 https://www.urbanacitizen.com/wp-content/uploads/sites/36/2015/10/web1_z-paws-kitten-Deanna-F-900-newspaper.jpgFall in love with Deanna. She is a cute black and white kitten with wonderful markings. There are five of Molly’s little kittens waiting to be adopted. The adorable kittens were born at the shelter shortly after their mother, Molly, arrived at Paws. Little Deanna likes people and will climb all over you and into your heart. She is a sweet kitten who likes to play. Consider adopting two kittens for double the fun! They will be the purr-fect pets. The kittens are ready for adoption, so get your application in fast. The kittens will have their shots and spay or neuter certificates when adopted. They are litter box trained. Come visit Paws Animal Shelter and adopt Deanna and one of her siblings. Stop by Paws Animal Shelter located at 1535 West US Highway 36, Urbana, Ohio 43078 or call Paws Animal Shelter at 937-653-6233. The Shelter hours are Tuesday-Friday 12-5 p.m., Saturday 12-4 p.m., Sunday and Monday-closed. You can email us at pawsurbana@hotmail.com. There are many wonderful cats, adorable kittens and fun-loving dogs at the shelter waiting for good homes. Paws Animal Shelter has a lot of kittens, cats, dogs and puppies to feed and is in need donations of Purina Kitten Chow, Purina Complete Cat Chow, Purina Dog Chow and Purina Puppy Chow. We also could use donations of bleach, laundry detergent and clumping cat litter. Paws Animal Shelter is a no kill shelter. We are a nonprofit organization that operates only by donations. We do not receive any city, county or state funding. We depend on public donations and our adoption fees to run the shelter. Please consider making a donation to help fund our shelter. We are always looking for volunteers to come to the shelter and help out. You could play with the cats or dogs to help socialize them. There are many small jobs that a volunteer could do. We also need volunteers to foster cats, kittens, dogs or puppies.